Vacation (noun) - Freedom or release from duty, business or activity. Recently, my husband Isaac and I traveled to the UK for 17 days exploring Scotland first then moving down to England. To be immersed in such magnificent beauty together brings about feelings of peace, gratefulness and awe-inspiring happiness. We believe travel refreshes us individually and as a couple. We are challenged in new ways. We learn new things about each other. And it broadens our perspective of culture, life and love. During our trip, we laughed in moments that we usually wouldn't laugh about back home. I danced in an open field, just because it was so breathtaking. We giggled when a Scottish police officer gave us a parking ticket just because we loved the way he talked. I sang worship songs while hiking and breaking a sweat. During the last part of our trip, we spent several days in London and hired a photographer to follow us around for a couple hours while we took in the breathtaking sights of Big Ben, Westminster and the House of Parliament for the first time. I wanted such a sweet, joyful time in our marriage to be captured while in the midst of a historical, majestic and romantic place. All photos were taken by Jesse McGhie Photography. Modern calligraphy is all the rage right now, and learning how to do it is even more popular. But why learn how to write pretty in this 21st century digital age? Unlike traditional calligraphy that follows a specific set of lettering rules and stays perfectly inside the lines, modern calligraphy allows you to "bounce" your letters outside of lines if you desire, develop your own style that can be similar to cursive and opens the door for more creative freedom. I have found that once you get over the hump of learning how to use the nib, understand how ink flows and get a groove down while learning letter forms, pointed-pen, dip calligraphy is quite therapeutic. Feeling the pen glide across the page while ink is slowly flowing out feels peacefully delicate. Because you simply cannot do calligraphy in a hurry or with an anxious mind, the practice of the art forces me to slow down and rid my mind of any stressors from the day. Even if pointed-pen calligraphy is just not your thing, brush calligraphy is just as fun and therapeutic. Brush calligraphy can be achieved using many types of markers, like Tombow markers, or by using a small paint brush. I keep hearing that hand lettering and cursive is not being taught as often in public schools anymore, and that is such a shame! However, researcher have found that when we write letters and words with our hands we learn better, are more successful, creativity is inspired and so much more according to thefederalist.com. Although this article focus on hand writing with pens and pencils, I truly believe hand lettering using calligraphy as adults can have the same type of benefits. Wrapped up in my own little world calligraphing. Writing birthday cards, addressing envelopes and making handmade, framable art are the best ways to make your friends and family feel loved. Who doesn't love something handmade with your time and skill poured into it? In the beginning, calligraphy can be quite frustrating, because you are learning how to use a new tool that your hand is not used to holding. Even to an experienced calligrapher, there can be frustrating mishaps like ink splatters and just honest human error. To succeed and keep on learning, you must be patient with yourself and the art form. I've learned that I am naturally not a patient person. I want to be good now, and I want the projects done in my own timing. * Bonus reason: It's fun! 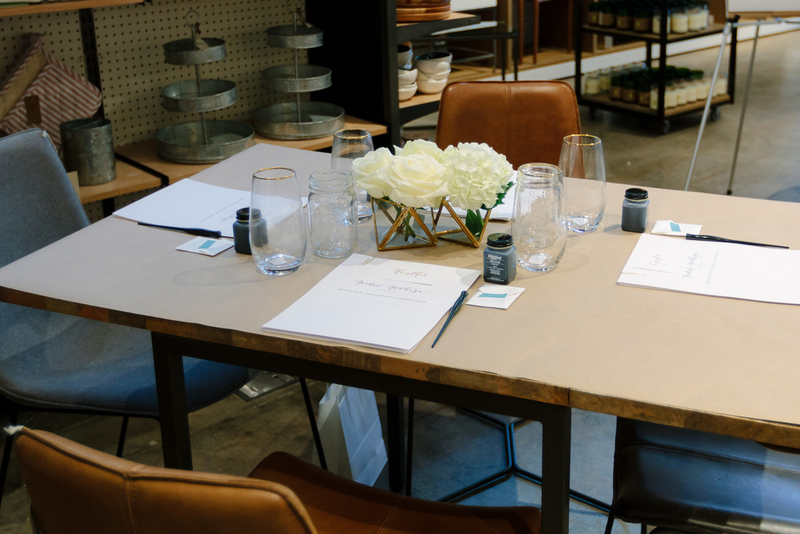 This summer, I taught two beginner modern calligraphy workshops at West Elm in Oklahoma City. So often calligraphy is seen as "pretty handwriting." I love the chance to set a high standard in my community for calligraphy as a skilled art that requires patience and a lot of practice. I love encouraging other women to learn a new hobby and appreciate the art as well. I want to thank Robyn Icks Photography for capturing beautiful photos of the events, and helping me set up and take down for each event. You are a rockstar. I also want to thank West Elm OKC for your hospitality, kindness and the space you allowed us to use as creatives. 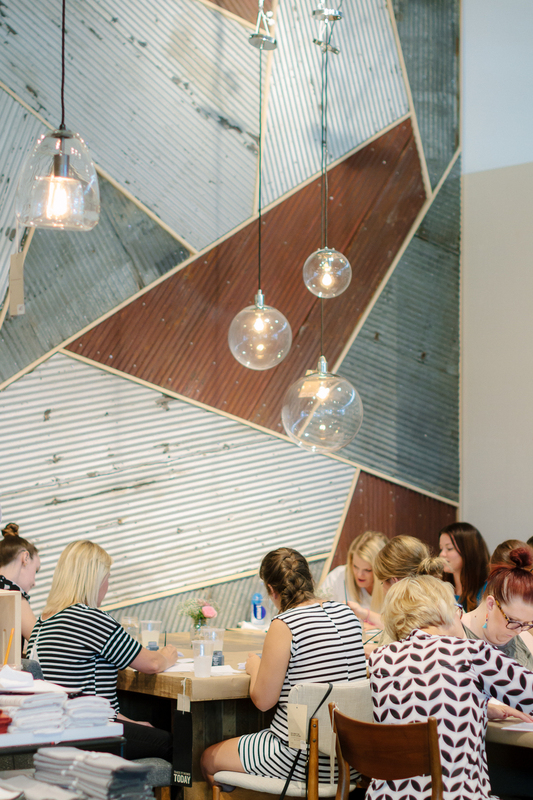 For the July workshop, Blair of Blair Sims Events helped plan the design, and "look and feel" of the evening. She did such a great job, and I loved Blair's help during the event. And Angie from Borrowed Charm was so kind to let us use some of her decor on this evening. Take a look through the photos of the events, and I'd love for you to join me for one of my Fall workshops starting in October! Purchase tickets on the workshop page. The cost to mail a wedding invitation suite is often an afterthought. Depending on how heavy and bulky your suite is, mailing your wedding invitations can add up quickly. Doing a little research ahead of time for budget awareness and working with your stationer can help this part of your wedding budget not be such a shock. Calligraphy envelope addressing written in black ink. The cost to mail a wedding invitation depends on the weight of the entire suite. To determine how much postage you will need to purchase from the post office or your stationer, take one wedding invitation suite stuffed into the envelope to the post office and weigh it. Typical invitation suites weight anywhere from 1-2 ounces. However, it can weigh more if you have ultra thicker paper, embellishments, wax seals, etc. For 2016 an invitation that weighs 1 ounce and is being mailed first class (what you should use), it will cost .47 in stamps. For an invite that weighs 2 ounces and mailed first class, it will cost .68 in stamps. For more pricing information for the various weights, visit weddingstamps.com/usps. Surprisingly, calligraphy does not affect the cost of mailing your invitation. As long as the hand-lettering is legible, it will be mailed with no issues. Calligraphy envelope addressing written in gold metallic ink. Stamps are the final piece of the puzzle and the ultimate icing on the cake for your wedding invitations. When stamps are cohesive with the rest of the design and theme of the wedding suite, they don't stick out like a sore thumb. 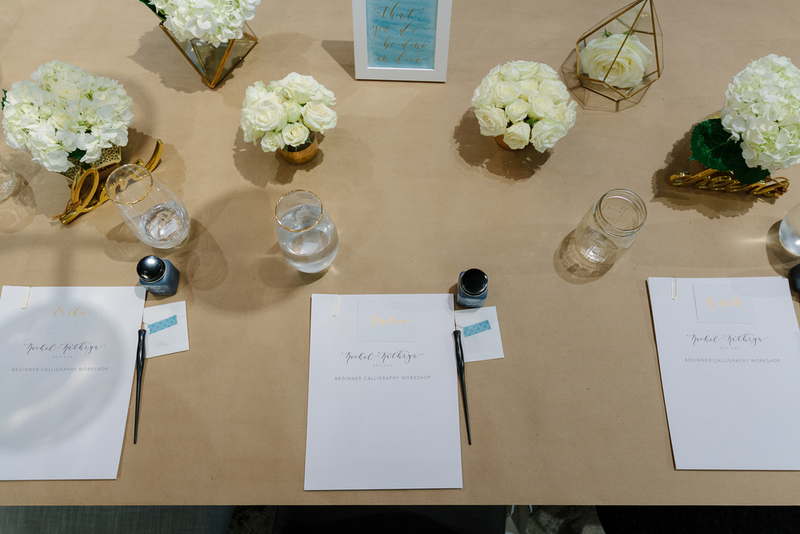 Oklahoma Wedding Planning: When Should I Hire a Calligrapher? You love the pretty, personalized look of calligraphy and you realized the task of perfectly writing out 250 addresses for a fancy event is very daunting and stressful. So, you decide you want to hire a calligrapher for your wedding invitations. At what point in the planning process do you involve a calligrapher? How long do they need to do this? Or are you wondering if you are too late or too last minute? 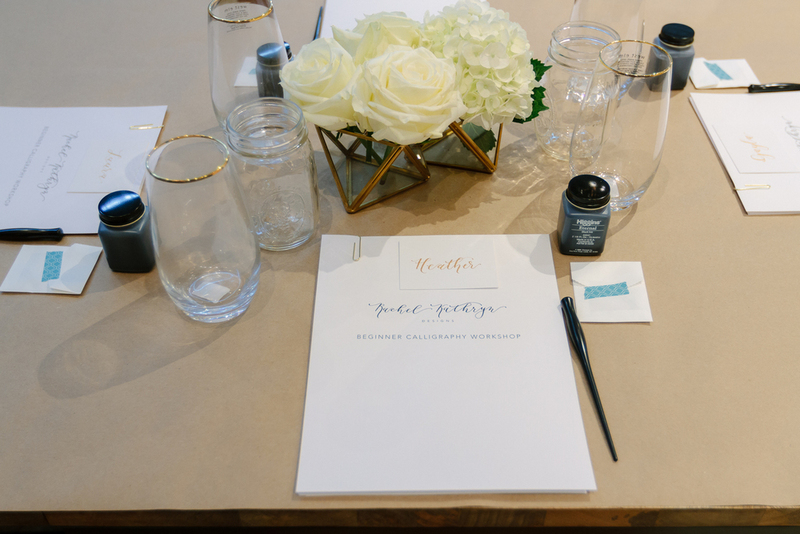 Although every calligrapher is different in his or her pace and timeline of projects, it is always best to involve a calligrapher early on in the wedding planning to secure time in their schedule. I always suggest reaching out to a calligrapher and invitation designer at least 6 months before the wedding, if not more. As a calligrapher and invitation designer myself, I prefer to have ample time to put careful thought and attention to detail to my bride's invitations. I love meeting with the bride in the very beginning to begin to develop a relationship with her and understand her entire vision for the wedding day. I strive to match my design and calligraphy with the vision of the event. For me, turnaround times are determined based on when you need to mail your invitations and what projects are already on my calendar. But to give you a rough idea, I typically ask for a 2-4 weeks for 100 invitations or less, and 6-8 weeks for more. I'm always willing to work with your wedding planner or stationer to discuss timing. I also ask that you involve me in the process of choosing and ordering your envelopes. Some envelopes simply won't work with pointed nibs. Even if the invitations are not done being designs and printed, I can still get the envelopes in my hands to begin work. But of course if you're the last minute gal stressin' about your envelopes, please call me. :) I'd love to see what I can do to help. No need to stress, we want your guests to feel loved when they get your invite in the mailbox! And I want you to have an heirloom, a piece from your wedding day, to remember this special time in your life. With it being "wedding season," your mind may be focused on planning a wedding, attending an upcoming wedding or maybe you hope to be married soon. My heart is not that your focus will be on the details and products of the wedding industry, but the reason for your love for the person you are with. Does it just feel good? Does that person make you happy? If you are getting married this year or hope to someday, I hope that you think deeply about those words, "I love you." What do they mean to you? And will your love for that person really last a lifetime or will it fade when life gets hard? Recently, I was chatting with a friend of mine about how to know when you love someone. I was sharing with her when I first told my husband, Isaac, "I love you," and how I felt confident saying three words and choosing him as my main man. Thinking back, it seemed so obvious. I didn't hesitate when I said it. But when I really try to remember how I knew, it's hard to describe. It almost seems too simple. Once I got to know Isaac over the course of a year, I knew that I didn't want to even try to do the rest of my life with anyone else. I knew he wasn't perfect, and there were things we disagreed on. But there are a lot of things we do agree on, like our morals, our belief in Jesus Christ, a growing family and activities we enjoy together. We are also compatible, meaning we are both introverts and home-bodies. We love our alone time to reflect and gain back energy from a long day. And we love just lounging and being at home. We also love to watch movies, travel, play with our dogs and eat out. Overall, we just enjoy the same activities and being with each other. Isaac and I on a recent trip to Hawaii. Of course, there are also activities we enjoy doing without each other as well, and that is okay. In fact, that is healthy. We are still our own persons, so we do not need to always be with one another to be happy. He loves video games and Oklahoma State football. I love watching sappy, romantic movies and working on my calligraphy. He loves his weekly "guys night" to do manly things that I can never do with him. And I love to have a deep conversation with a girl friend over wine to discuss womanly things, which he can never do with me either simply because he is not a girl. We don't complete each other. We go well together. We work well together. We enjoy each other, and can do life together. He's my main person over friends and family. We encourage each other and are there for each other no matter what. I knew I loved him when I knew I didn't want this life with anyone else. I didn't want the daily grind with any other man. I wanted the rest of my life - the good, the bad and the ugly - to be walked with this man. But he is a choice. Even when things get hard, and you know they will (you're fooling yourself if you think life with your spouse-to-be won't get that hard, because "your love conquers all"), you must continue to choose your person each day. Isaac is my perfect choice for our imperfect life here on earth. My online shop is now open! Now, you are able to purchase original, hand-written calligraphy art work straight from my website. Pride and Prejudice calligraphy quote available in online shop. When you purchase your made-to-order custom art, each piece is hand-written from scratch and mailed to your door-step for you to feel the delicate and intricate calligraphy ink and frame in your home, bedroom, office or gift for a loved one. Of course, I still take requests for custom pieces, however, this online shop highlights my favorite, romantic and feel-good words written with beautiful, calligraphy ink that will make your soul smile. Home is Wherever I'm with You calligraphy quote available in online shop. Pamper yourself with hand-written words that will brighten your day or motivate your soul. Never mass printed, this calligraphy art is made especially for you and with love. Calligraphy old hymn art available in online shop. Although I can design invitations or create calligraphy anywhere, creating at my kitchen table on a daily basis was becoming a difficult task. It was messy, all over the place and felt disorganized. Plus, I had to clean up so we could each dinner every night. So, I decided I needed a desk and chair in my own little corner to think, create, design and make pretty things. So, we made room for a small, well-lit area in the guest bedroom of our home for my design business. It's perfect and lovely. And it makes me feel happy. The vintage desk and chair were given to us by my in-laws. The desk used to belong to my husband's Grandma Mary and the chair is from England. Each show much love and use, yet so much character and inspiration. I wanted to share with you where I now spend my time writing beautiful words in calligraphy and creating pretty wedding invitations and designs. I hope you enjoy! My own little corner to think, ponder and create pretty calligraphy, invitations and designs. Bohanan vintage chair from England. My ever-growing collection of nibs. Here sits my lamp for nightfall, collection of nibs and a framed photo I bought by Robyn Icks Photography. Ah, a clean sheet of paper, fresh black ink and a nib to write whatever my heart desires. Modern calligraphy written in my Danielle font style. My desk space to create pretty things. Because who wouldn't want fresh roses on their desk for inspiration? Gorgeous fresh yellow roses for inspiration and happiness. My collection of vintage and useful books. Part of our wedding vows that I wrote in my Bethany calligraphy font style to remind me of the promises we made to each other. All the scratches, bumps and bruises give my desk character and shows the love it has been given over many decades. These drawers on both sides of the desk give me wonderful storage too! This quote from my grandmother's etiquette book makes me laugh every time I read it. But really, it is still so true today in 2015. Weddings, big or small, can be stressful. There are so many moving parts and emotions flying around. It's a big day - lives are changing, a last name is dropping off, two families are merging together, parents are giving away their young daughter and two love birds are vowing before God and family their commitment to one another. Your wedding day is a big deal, and this day deserves expert help in at least some areas of the planning process for a smooth and happy experience. Sometimes with so many close relatives involved and emotions flying around, it can be difficult to make decisions. It can be difficult to actually enjoy your engagement season and not feel stressed with so many decisions to make and things to do. And of course, you want it to be flawless and beautiful. Hiring wedding professionals to do the time-consuming work and research for you while also giving you an unbiased opinion on what will look best, will alleviate much of the stress and tension. Professionals from photographers to planners to invitation designers know exactly what will look best for your wedding, because they do this kind of thing for a living on a regular basis. They know what they are doing, and they are good at it. Trust them, lean on them and just enjoy your engaged time with your spouse and the day that you will one day tell your kids and grandkids about. Wedding invitation suite and calligraphy designed by Rachel Kathryn Designs. Photo by Erin Goodrich Photography. Determine a couple aspects of the wedding planning that are most important to you or give you the most stress when you think about having to do them Set aside the budget to hire professionals for those couple areas. Maybe the idea of you or your mother dealing with all the set up, decorating and coordination on the wedding day makes you cringe, and you don't want coordination to to get in the way of enjoying your day. So, set aside some extra money in the budget to hire a wedding planner or day-of coordinator. Maybe sending out beautiful, classic invitations that give your guests an exciting first glimpse into your special celebration is important to you. Leave the designing, paper selection, printing, assembly and envelope addressing up to a professional who has the time and experience to give you an amazing product and less stress. Of course for wedding invitations for calligraphy, I would love for you to come to me. However here in Oklahoma there are other amazing options as well like Paper N' More or Chirps and Cheers in Oklahoma City. For photography, Erin Goodrich Photography located in Tulsa, Oklahoma and Magnolia Adams Photography in OKC are both amazing. Erin shot a lot of the beautiful photos on my website! For wedding planners and floral design, I would definitely recommend Talia Morgan of Inspire Events and Design or Forever Cole Events both in OKC. Erin Goodrich Photography also offers day-of-coordination. As a member of the Rising Tide Society, an organization that educates and empowers creatives to thrive in the spirit of community over competition, we are encouraged to highlight and collaborate with other creatives locally and nationally. I love this group of creatives and learn new things from them every day. So in the spirit of highlighting other creatives, I wanted to share some of my favorite stationary and design brands that inspire me to do what I do here in Oklahoma. Rifle Paper Co. has taken off in the last few years with their vintage floral designs on iPhone cases, stationary, gift wrapping and more. I see their stuff everywhere, and I love it. I'm drawn to the muted vintage, yet simple colors, florals and typography. A lot of their inspiration for design comes from Europe and their travels around the world and the U.S. I also love the fact that just five years ago Rifle was started by co-founders and married couple Anna and Nathan Bond in their garage apartment. What a fun husband and wife team. They also share the same believe I have that life's sweet messages and encouragements are best shared through a hand-written letter or hand-picked card. The sweetest hand-written birthday message from my husband right before we went on a weekend getaway to Branson, Missouri. Reading this reminds me that I am loved (because he took me to Branson to see the Titanic museum!) and to soak up the simple things in life. I have also used Rifle's paper before as envelope inserts for my wedding invitations. They are amazing and make any invitation suite look beautiful with a pop of color. Another brand that inspires me is Crane and Co., which was started by Stephen Crane in 1770. That fact alone draws me to the brand, because I LOVE history. I love antique shopping, documentaries, old films and all the stories behind them. If you read about Crane's history on their website, you will learn super fun facts like Paul Revere engraved bank notes on Crane paper which helped finance the Revolution. The Queen of England announced the celebration of her 100th birthday on Crane paper. And, our paper money is made from Crane paper! Another thing I love about Crane (among the many things) is the fact that they are a library of knowledge when it comes to stationary and invitation etiquette. And they would know the proper way to say something when they have been around for so long. Not only are they a wealth of etiquette knowledge, they share their stationary etiquette tidbits and best practices on their website and even published a paperback book, which I own. Regardless of the time and trends, Crane stays true to the classic and traditional ways . They truly believe that paper and stationary, when done right, is timeless and altogether lovely. And I do too. The other night I listened to KC Clifford at a house concert. Her folk-style music, lyrics and personal descriptions of the songs really spoke to me. While sharing honest stories about her life, struggles and joys, she shared some inspiring words that her grandmother said to one her. "You have one life to live. Go live it, and the rest will work itself out." Throughout my life, I tend to be always looking forward to and planning the next big thing. When I was a young girl, I wanted so badly to be 13 - a teenager. Then, 16 so I could drive. Once I met my husband, it seemed like I was planning our wedding in no time. A couple years of marriage, and we are talking about babies. Life really is one big moment after another. It makes it difficult to smile at the moments that are happening now when we are always looking forward to things we don't have. But what if we just stopped for a minute and reveled in the now a little bit more? I don't want to look back on life one day sad that I didn't enjoy the sweet moments that were actually happening. The next big things in my life will happen eventually, and it will all work itself out. But I need to live the life I have right now and enjoy it to its fullest. So right now, I have a husband who is so kind, thoughtful and loving. We have two dogs who make us laugh and give us so many snuggles. We have a quaint home that gives us a roof over our heads and a warm place to sleep in a safe neighborhood. And I have developed a fun and challenging design business that gives me a chance to meet such beautiful, kind and talented individuals. What should you be cherishing right now in your life? After I saw the new movie Cinderella in theaters this year, I was immediately inspired to design a super girly and enchanting wedding invitation set. The big sparkly blue ball gown, the shoes (those shoes!) and the overall magical feel of the movie put me in the romantic spirit. This invite is a modern take on a wedding invitation fit for a royal bride. The cream and light pink envelopes and inserts are slightly shimmery to give a magical, fairy tale feel to the paper. The reply card is given the same amount of detail as the rest of the suite. Perfect for all your royal guests. The black, romantic calligraphy is written with a modern hint. If you love this blog post and the photos, please share with your friends! Photos by Erin Goodrich Photography. Which one is best to put on your invitation? More and more and I am seeing "regrets only" used on shower invitations for smaller events. Why is that? Most of the time you will have more guests who are able to attend as opposed those handful who cannot. As a host, it is easier to wait for a handful of "can't make it" phone calls rather than hoping that 20-30 guests will let you know they are coming (when mostly likely they are). As a guest myself, I always appreciate a shower invitation that allows "regrets only." I am much more likely to remember and make it a priority to let the host know I am not able to make it. When I am planning on attending an event, I usually mark my calendar, set the invite aside and move on with my day. For larger events like weddings, I always recommend the request for an RSVP. As the one planning the event, you will need to know a more concrete guest count for food, planning, etc. And guests typically make it a priority to pay more attention to an RSVP for a large event. So, is it better to use "regrets only"? There is really no wrong answer. It is all preference! As a host, you know your guests better than anyone. Decide which direction you feel comfortable with in order to make your event a success! 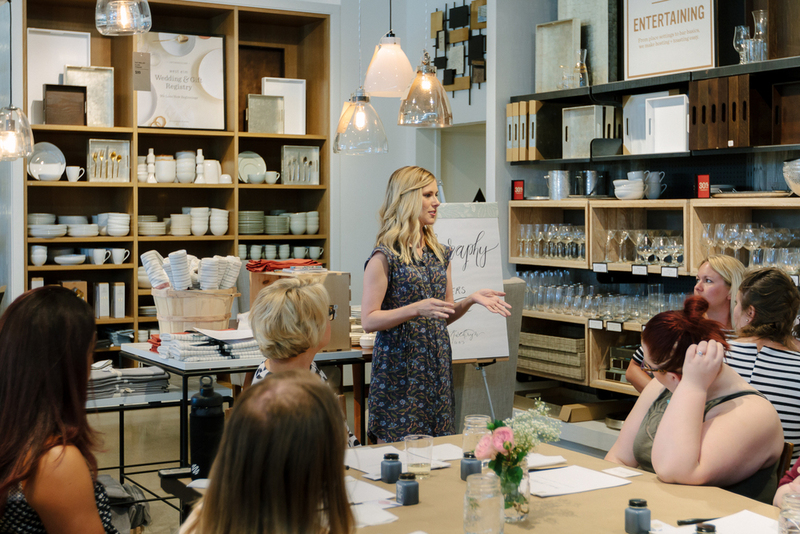 When I took a calligraphy class with Frameworthy Designs in Norman, Oklahoma, Tara Forth, owner and designer, began the class talking about the importance of patience when you are learning calligraphy. What she said has really stuck with me through my journey of learning and practicing my hand lettering. I have not by any means mastered calligraphy, but I do feel that it is an art that has come naturally to me. I love the feeling of stroking the ink-filled nib up and down on smooth creamy white paper. I love making flourishes on my letters, and I love the end result. It's beautiful, and it's my own. Tara reminded us in the class that our handwriting is unique to us. We should embrace our own hand lettering, and not try to make it look exactly like someone else's handwriting. Although I strive to make my calligraphy look streamline and overall flawless, it wouldn't look like true handwriting without little bits of imperfections throughout. It wouldn't be unique to me without tiny pieces of imperfections that no one else's handwriting would have. So when I have been practicing for hours trying to make it perfect and getting frustrated over a flaw, a little voice inside me whispers the word patience. Be patience with yourself, I hear. There are beautiful and wonderful things for those with patience. There is strength in patience. Learning calligraphy is teaching me and reminding me of the importance of patience. I know It will shape me into a stronger woman - exactly the kind of woman I want to be.